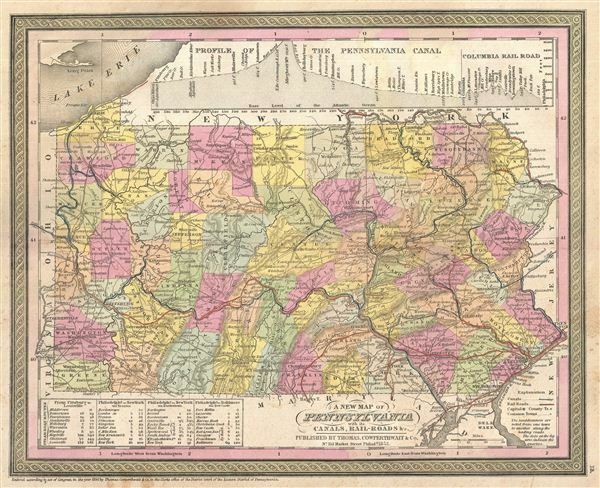 This carefully defined piece of S. A. Mitchell's 1854 map of Pennsylvania features the state's cities, towns, roads, canals, and railroads in great detail. This map covers from Lake Erie eastward to Delaware and New Jersey. An elevation profile of the important Pennsylvania Canal system fills the upper right quadrant of the map. In the lower left quadrant steamboat travel distances are rendered in tabular format. The whole is engraved and colored in Mitchell's distinctive style with green border work and vivid pastels. Political and topographical features are noted and color coded with elevation rendered by hachure. Very good condition. Minor small marginal discoloration, lower left quadrant. Blank on verso. Rumsey 0537.014 (1846 edition). Phillips (Atlases) 814.